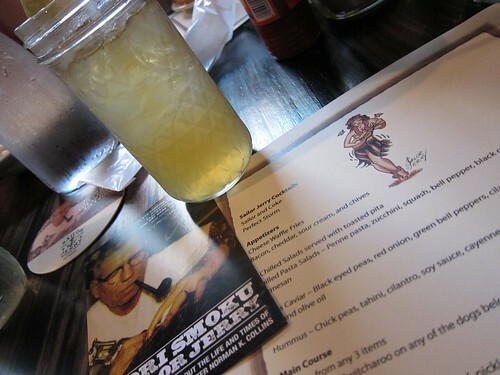 I recently had a really great dinner with the folks at Sailor Jerry's Rum over at Frank restaurant. They were doing a sneak preview of the Hori Smoku documentary on the life and times of tattoo artist Sailor Jerry and invited a few of us food bloggers out for some hot dogs and Sailor Jerry cocktails. How could I say no! 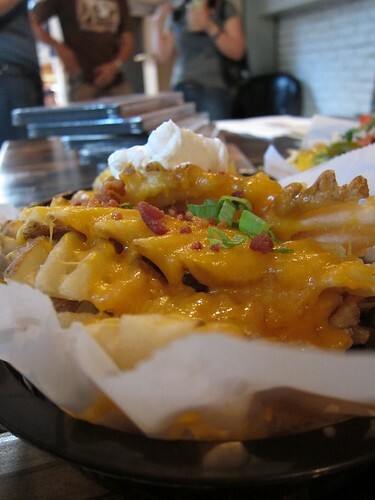 We started out with a few appetizers including the Bacon Cheese Fries. Bacon and cheese and waffle fry? How can that trio be wrong? It's not. 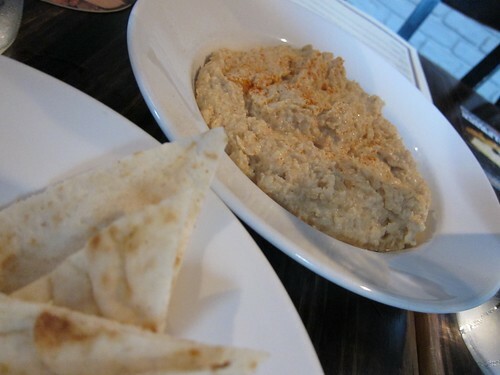 Some SUPER garlic-y hummus (I wouldn't recommend it). A chilled pasta salad. 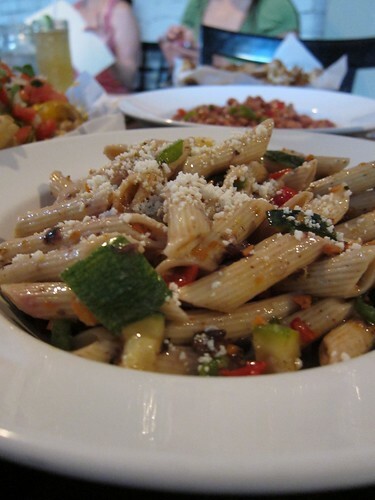 Kind of average as far as pasta salad goes. 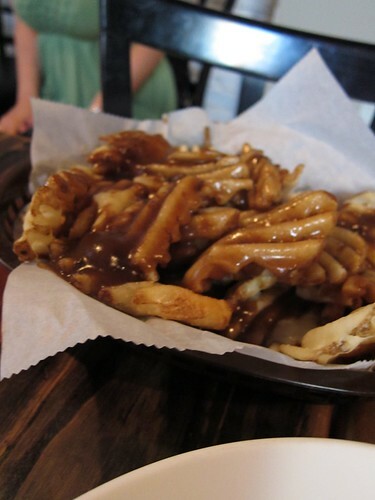 The real star of the appetizers were the basket of Canadian Waffle Poutine. OMG. I know I made fun of those crazy Canadians when I first heard about poutine. How can anyone ruin a waffly fry with brown gravy and cheese curds?? But I'm here to amend my previous opinion and officially declare victory to the Canadians. Poutine is awesome. Especially Frank's poutine. I wouldn't let the server take the basket away, even after it was cold and congealed. It was still good. 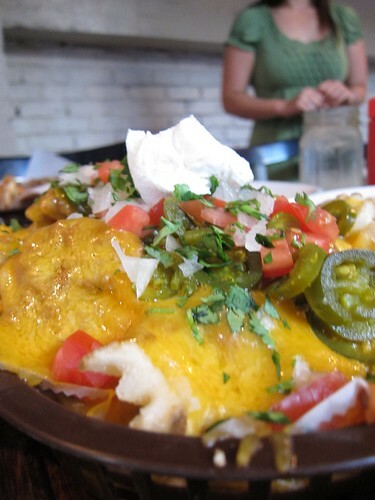 Waffle Fry Nacho's. While I didn't like them as much as the Poutine, they were still greasy, tasty happiness. Yum. We settled into our seats with our Sailor Jerry's Perfect Storm cocktails. A combination of Sailor Jerry's rum, ginger beer, bitters, and lime juice. It was really tasty and would make for the perfect refreshing drink on a hot summer's day. As we drank our Perfect Storms and ate some appetizers, we talked with the director of the documentary we were about to watch. He talked about all the crazy characters he met while filming and some tricks he used to film on a shoestring budget. I ordered a Jackelope dog as my main course. 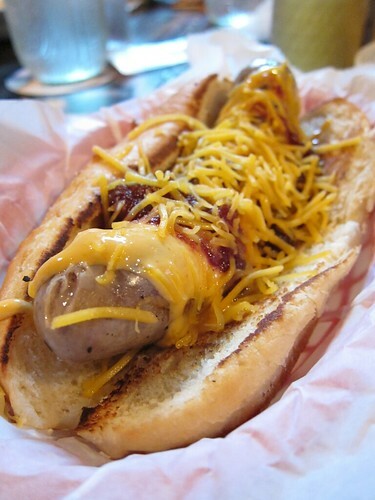 Local antelope, rabbit & pork sausage, huckleberry compote, sriracha aioli, applewood smoked cheddar, um how could I say no? It was really delicious. However, after gorging on the poutine, I didn't have much room in my stomach. I was only able to eat half, but I really wish I could have eaten the rest. It was very tasty. The documentary was really great. It was about Norman "Sailor Jerry" Collin's life. Did you know Sailor Jerry (before he was a rum), was a famous tattoo artist from Hawaii? It explored his life and influences, where he got his ideas and how he radically altered the art of tattooing in the 50's and 60's. It also discussed his influence on other, modern, tattoo artists. Like did you know that Ed Hardy, before he designed clothing for the fist-pumping residents of the Jersey Shore, was a famous tattoo artist? 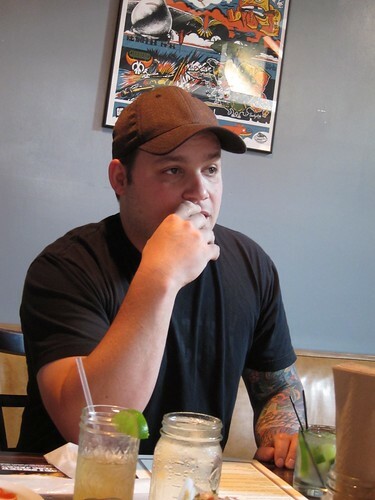 He studied with Sailor Jerry, before traveling to Japan to study traditional hand-tap tattooing. If you're interested in seeing the documentary "Hori Smoku, the Life and Times of Norman 'Sailor Jerry' Collins", the folks at Sailor Jerry's are hosting a free screening. It'll be at Alamo Drafthouse on Sunday, June 13th and Monday, June 14th at 10pm. All you have to do is RSVP! It's a great movie and I highly suggest you check it out.